Knepp Castle is possibly an 11th century earthwork motte and bailey fortress, founded by William de Braose. 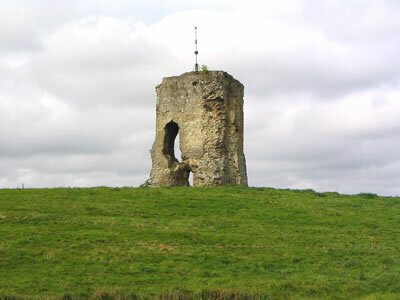 In the early 13th century, after forfeiture to the Crown King John founded the stone castle, when adding a two storey keep or hall-house to the natural low mound. Surrounded by a moat, with a counterscarp bank, the keep and a chapel were also encased by a curtain wall, flanked by a gatehouse. Sited in an important centre for hunting, it was used more as a fortified hunting lodge than a castle. In 1215, King John ordered its castellan, Roland Bloet to burn the buildings and destroy the castle but the order may have been rescinded. Returned to the Reginald de Braose in 1218, when King Henry III visited, in 1324 King Edward II and King Richard II in 1384 also visited. By the end of the 14th century, the stone walls of the castle were excluded from repairs but in the early 16th century, there was still a steward in the castle gate. Sadly in the mid 18th century, one corner of the keep was left to stand alone, when stone from the castle was used to build a turnpike road. 9 miles south is Bramber Castle and 13 miles south-east is Castle Ring. Knepp Castle is located west of West Grinstead, off Worthing Road. 21 miles north-west of Brighton, on the A27-A283-A24. Knepp Castle is visible from the road.